Samantha Crone and Craig Derrick with Archie, Cameron, Kieran, Kyra and Georgia. Police officers saved Christmas for a couple and their five children after thieves stole all their presents. Samantha Crone and her partner Craig Derrick left presents worth £500 locked in their car to keep them out of sight. 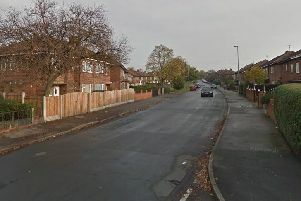 But thieves broke into the vehicle, which was parked outside Miss Crone’s home on Woodmoor Road, Kettlethorpe, sometime between 7.30pm on Sunday, December 13 and 6.30am on Monday, December 14, and stole the gifts. PC Raif Kurtovic and PCSO Katie Edwards, of Wakefield Rural neighbourhood police team (NPT), visited the couple to discuss the incident. And determined not to let it ruin their Christmas, the officers collected toys donated by their colleagues and retailers and gave them to the family. Miss Crone, 28, said: “We were so upset to see that the presents had been taken. “They had ripped open the presents and the ones they did not want they just left behind. Miss Crone said her family was left overwhelmed after the officers surprised them by visiting her home with four bags full of gifts. She said: “They asked if they could come round so I thought they wanted to ask more questions. Then they arrived with all these presents. PC Kurtovic said: “Some of our colleagues were keen to help and they donated gifts. Friends and family also came to the couple’s aid after hearing about the incident. Newspring Church in Ossett gave them a £100 voucher and another family member gave them £50. Miss Crone and her son Archie plan to spend Christmas Day with Mr Derrick and his four children Cameron, Kieran, Kyra and Georgia. Police are appealing for anyone who witnessed the incident. Anyone with information should call PCSO Edwards on 101 or Crimestoppers, anonymously, on 0800 555 111.